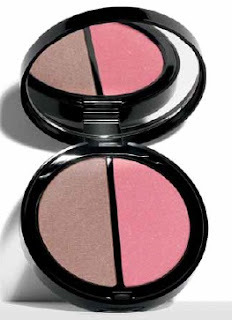 Bobbi Brown's new Desert Twilight Collection for Fall 2012 combines soft hues with bright colors to create a late-summer glow. It stopped me in my tracks at Bloomingdale's last weekend. Offering a pop of Southwestern-inspired turquoise against a backdrop of sun-swept rose, plum, and bronze shades, the collection is playful and, as you'd expect from Bobbi Brown, wearable. I did a quick "shop and run" in the store, amazing the rep, no doubt, with my quick selection of half the collection. I've got a lot to show you, but I thought the limited-edition Blush Bronze Duo ($36), given its perfection for wearing here and now, is perfect for an opening feature. This duo will create bronzed skin with a bit of shimmer. It’s naturally gorgeous and super-colorful (in a good way). The ultra-convenient compact houses both bronzer and blush to create a stunning, sun-kissed look with Bahama Brown Illuminating Bronzer and Pink Peony Shimmer Blush. See note below, please. The strangest thing is that they are labeled in the opposite way on the compact. There, it says the brown shade is the blush, and the pink shade is the bronzer. That's a big oops. Even the Nordstrom Web site has the names switched. How could the pink shade be the bronzer? No matter, we all know how to use luscious colors. Here are swatches of the shades, applied very heavily with a sponge-tipped applicator, hardly the way we apply our bronzers or blushes. I wanted you to see the saturated colors so that you could imagine them as sheer veils on your skin. Bahama Brown Illuminating Bronzer could not be more beautiful. It is a clear brown with just a hint of pink (look carefully). The hue will keep it from being muddy on any skin tone, providing a natural bronze shade that will serve to bronze, contour, or even blush the skin, depending on your skin tone. Pink Peony Blush is a pink designed to work for almost all. It's just this side of cool in tone, but warm enough that it can work on warm-toned complexions, and it's a perfect complement to the bronzer. Don't the pink and brown shades look fabulous side by side? I needed more blush - and another bronzer - like I needed a third leg. Still, there was no way I was going to leave this duo at the store. I've got much more to show you. Bobbi Brown cooked up exquisite colors for early fall. From the Desert Twilight Eye Palette to the Creamy Colors for Lips and Cheeks (in cute little tubes), the colors in this collection are stunning. Wait 'till you see the Nail Polish shades! I haven't purchased them yet, but I'll be ordering more when Bobbi Brown puts the collection up on her Web site next week. I'll show you everything I purchased before that. Note: I checked with Bobbi Brown and was told that the compact is correct. They consider the brown shade the blush and the pink peony shade the bronzer. That makes my feature even more confusing, but I still contend you know where to use the shades - anywhere they look good on you! Update 6/21: Read the comments. Bless her heart, Gina has pulled out her BB shades and put the name confusion to rest! Hmmm . . . The bronzer is the blusher and the blusher is the bronzer. Makes you wonder what rabbit hole BB fell down! No matter, they're lovely shades non the less and will look great going into autumn: deeper, cooler colors but with a bit of lingering warmth. So pretty! I bet that pink is to die for on your skin. As for the brown, that pink undertone makes it perfect for us lighter skinned gals. It's the pink undertone that I love about Guerlain's Blonds and Sunblonds and Chantecaille's St. Barths. Ohhh, I cannot wait to see this collection in person, the promo pic and a few others I've seen online have been amazing! Thanks for sharing and I look forward to your additional swatches. I have a feeling I'll be picking up half the collection myself! Good grief, I have just about everything in my Nordstrom bag, and I only need to hit the buy button! You have a way of bringing us in!!! No lipsticks? I still like them, glossed on top! Well, one thing less to buy! The collection is already up on the Bobbi Brown website!!! I may get Blue Moon even if it is not normally what I wear...... looks so interesting and so does the eye liner !!! That IS very strange...I wonder if they realized their error a bit late and decided to save face and go with it? Either way, you're absolutely right: they're gorgeous and people will know where they personally prefer to have the color--so it works. I laughed when I read your comment. Rabbit hole indeed! No matter what they called the colors, they ARE really pretty - and should work for most of us. Did you hit buy, Judith? Wow, it's early, Nancy. They told me next week - just yesterday. It may be face saving. That was my thought. Looking forward to seeing the new lip & cheek creamy colors and nail polishes! Yet again you have read my mind and reviewed something that caught my attention and I was thinking of buying. I think I'll go with the pink as a blush as I don't blush brown. hehehe by any name, a very pretty duo! Your photos are amazing and the collection looks even more stunning in person. This is Bobbi's most wearable palette in years. I bought most of the collection today. Now, now, ladies...Bahama Brown is a discontinued BB shimmer blush and Pink Peony is an Illuminating bronzer, brought back from the BB Peony and Python(limited) collection.. Anonymous, I'm not sure why it matters to you that these were formerly available shades. The duo combines them beautifully, and if women like it, then BB's goal has been met. Thanks, Penflair! The is a super-hit collection in my view. The truth will set you free. Love it! Evelyn, try the brown! Or mix it with the pink. Play! This is a very pretty brown. I haven't purchased the nail lacquers yet. I'm sure someone will and feature them. Those names (a peony pink bronzer?) have to be a CYA debacle. The packaging label is not incorrect on the blush/bronzer. The pink shade - Pink Peony - is a bronzer. There was a collection about a year or more ago with some colorful bronzers. I am quite pale, and I love them. Pink Peony was one of them, as was a gorgeous color called Maui (rather peachy and gold). The Bahama Brown blush has been around for years as well. great shade. Hi, Charlestongirl! I posted last night (as anonymous)and it seems I was rude. I only meant to stand up for my Bobbi! :) No CYA going on.. the bronzer and blush colors are what they are ... and aren't they GORGEOUS!?!?! Bahama Brown shimmer blush has been a staple of mine for years. I also couldn't be happier that we have our nail polishes back! I don't normally do turquoise on my fingers, but in the summertime, anything goes on my toes! You weren't rude, hon. I get frustrated sometimes by what appears to be a criticism of a color - mostly dupes, sometimes of discontinued colors, sometimes of current ones. Glad you are standing up for BB! She has earned it. I am still confused, though. I have Bahama Brown in my house somewhere, but it was labeled a bronzer, right? Not a blush? Do you have yours handy? As I continue to point out, I don't really care what they call them - they are so pretty. BB really knows how to create a beautiful pairing. I do have it handy, as a matter of fact! Right in my handy-dandy Bobbi Brown 6 pan customizable palette. Bahama Brown Shimmer Blush #5. I think the others might be confusing it with an illuminating bronzer that is still available at counter which is just called Bahama(soon to be discontinued,I believe). Totally different color, as the Bahama bronzer is more of a true bronzer, and the Bahama Brown blush has that lovely rosy undertone which makes it so special. ( Bahama Brown used to be used as a bronzer on fairer ladies like us before the Illuminating ones like Bahama, Bali Brown, Antigua, Maui, etc. came along) Regardless, I love my Bobbi, and I LOVE this collection! SO much more to come, too! Love your blog, CG! I normally don't just bust into a product description, but I love my Bobbi, and my feathers were getting a little ruffled,so I jumped in. Beautiful colors are beautiful colors, and we certainly know what to do with them, regardless of what they are called. @Gina, I agree that Bobbi deserves kudos for just about everything she does and I adore her! And one of the things I love about her is her blunt honesty. No pulling punches around Bobbi. She's the best...and so are her products. Didn't mean to ruffle feathers!